Now that Disney bought Star Wars, I hope they get a little bit riskier and produce new stuff loosely based on the classic trilogy. 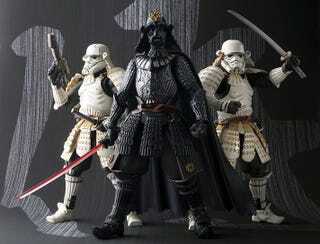 A Japanese version would look amazing, as these cool action figures demonstrate. It's only a natural step—as George Lucas' original saga was directly influenced by Kurosawa's work.